…And most importantly proceeds will go to our ongoing efforts to provide scholarships to young men in the Gwinnett County. Over the past five years, in partnership with the LDAC Foundation, we have provided over $123,000 in scholarships; mentored more than 300 young men, and provided assistance of more than $50,000 to help high school and college students. This year, we aim to continue that tradition. We are currently putting together another winning line-up which includes, Live Bands, DJ’s, a Delicious Menu, and more…Act Now to Get Your Tickets. Last Year we Sold Out, and we are sure to sell out again this year! Parking – Limited VIP Parking is Available at the point of Purchase. Otherwise, please park your vehicle in the Vines Park parking lot, and come to the Park Entrance to Load the Bus. Shuttles will run for the entire night to transport you from the parking lot to the front door of the mansion. 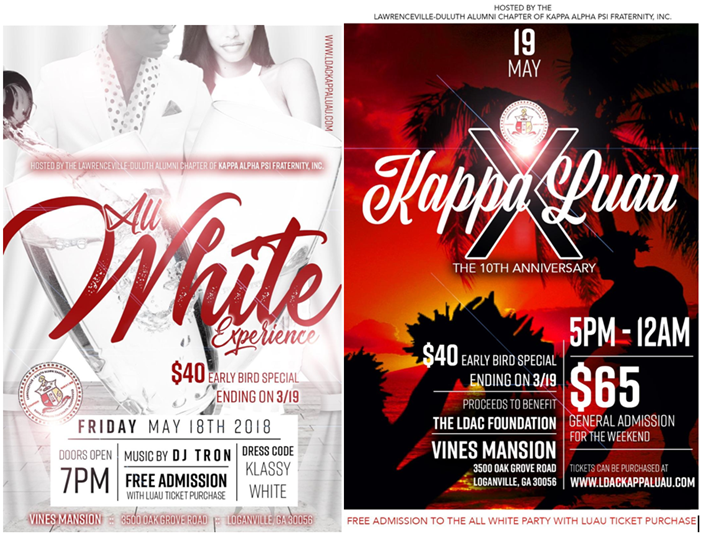 PRICE: ONLINE: $50 Until May 5th, and $65 After That, ALL WHITE ONLY IS ONLY $40 – ONLINE, NUPES RECEIVE A SPECIAL DISCOUNTED PRICE THROUGH 03/19 (Please Contact an LDAC Brother for Details), ALL WALK UP TICKETS $65 AT THE DOOR! Parking – Limited VIP Parking is Available at the point of Purchase. Otherwise, please park your vehicle in the Vines Park parking lot, and enter through the Park Entrance. Shuttles will run after 9PM to transport you from the mansion back into the Parking Lot. 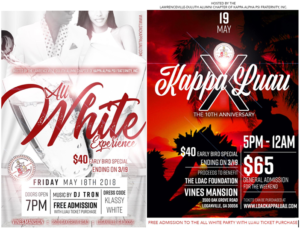 Did we Mention Proceeds go to our LDAC Foundation Scholarship Fund, Where we will have Already Awarded More Than $123,000 in Scholarships to African-American Males in Gwinnett County?